Grate jalapeno and garlic (or finely mince), and combine with the lime zest; set aside. Heat olive oil in a large fry pan over medium heat, and add the sweet potato cubes to cook for a few minutes. Stir in the jalapeno mixture, and cook until the potatoes are lightly browned. Add a touch of water, and allow to cook for an additional 2 to 3 minutes. Push the potatoes to one side of the pan and brown the sausage on the opposite side. Combine with the potato mixture once browned, then add the kale. Lower the heat and cover the pan with a lid. Meanwhile, heat a small nonstick pan over medium heat – cook the eggs, one at a time, either sunny-side up or over-easy. Set aside until ready to serve. Off the heat under the hash pan once the potatoes are soft and the kale is wilted. Add the blue cheese and parsley, and stir until the cheese is fully melted. Finally, mix in the hot sauce (as much as desired). 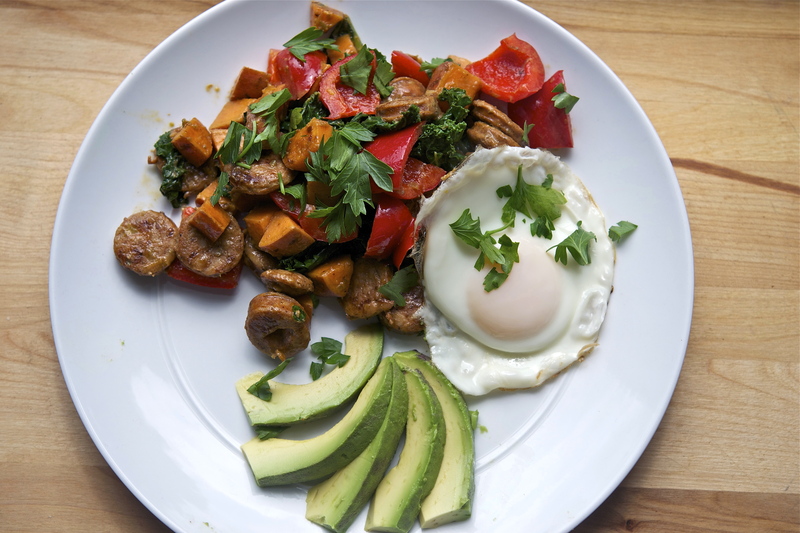 Scoop some hash onto a plate, top with a fried egg, and then arrange several slices of avocado on the side. Serve immediately.